From the tower watchman’s room, it’s only a few more steps up to the viewing platform of St. Georg’s Church, where a fantastic panorama awaits the visitors – a view of wholly intact city walls with their turrets and gatehouses, of magnificent Medieval and Renaissance houses, of the large expanse of the Nördlinger Ries. At 22.00, when the watchman shouts for the first time "So, G’sell, so", the traditional watchman’s cry, over the roofs, and the town’s lights twinkle beneath him, there’s no longer any doubt: he has, undisputedly, one of the most beautiful workplaces in Germany! 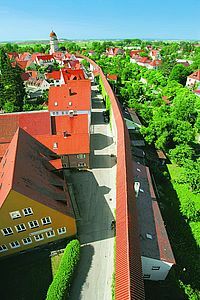 Discover Germany‘s only fully preserved town wall that you can still walk all the way round.